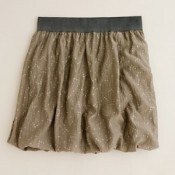 I just ordered this cute, bubbly, skirt in a color that will either go with everything or that I will MAKE go with everything for the fall, winter, and early spring. I am trying to be good about shopping – so this is the only item of clothing I am allowing myself to purchase for the month of September/October. Hold me to it! It was 50% off – can’t forget to mention that! It’s deals like these that make those annoying weekly emails from all my favorite retailers a little more bearable.